Meet Prince Ian, the final free digi contest image. When I saw Prince Ian, I immediately thought of the fleur de lis pattern. 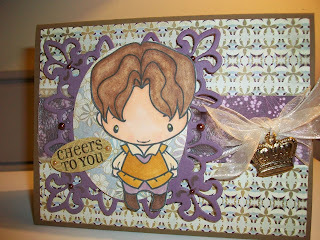 For this card, I used my Spellbinders Fleur De Lis pendant die as a backdrop for Ian. I also used a metal crown charm and half pearls to further add to the regal feeling. The crown charm was very shiny, so I toned it down by rubbing it with black Stazon ink. The papers I used are: Perfect Plum, Soft Suede, and Basic Grey's Wisteria paper pad. Unfortuantely, The Greeting Farm decided to end the relay contest today, due to an overwhelming response that continued to crash their server. I hate to see the relay contest win, but I received four new digital images and had fun while it lasted. 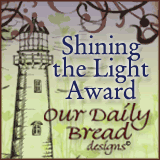 The Greeting Farm is having a digital download relay contest this week. Each day they have a new unreleased digital download available. If you make a card and turn it in on the time the following day, you will continue to receive the free downloads. If you keep this up all week, you will end up with six free digital downloads. Today's image is called "Mer Ian." Ian as a mermaid? I didn't know there were male mermaids. In fact, I'm not even sure if there are female mermaids. Sea and water themes are always a challenge for me, so I usually avoid them. I decided to give this one a shot so I can continue with the week-long contest. For the background I stamped several sea images then colored them in and inked the top half in blue. Ian has some glitter in his hair and on his tail, as all mermaids should be sparkly. Can't wait to see what the next download will be. 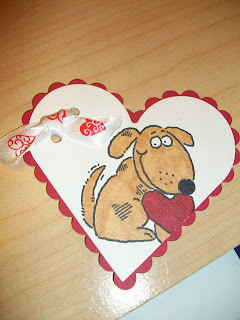 Just a quick note to say that I won The Greeting Farm's Valentine's treat holder contest. 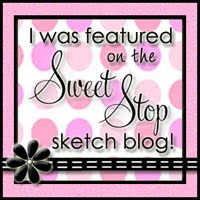 I posted the picture of my entry on my blog on January 22, see below. This was my first contest entry, so it is exciting to win! I won a free digital download of my choice. I was sorting through some of my stickers and other items I rarely use and I came across a felt cat I purchased at JoAnn's Fabrics. I think I initially purchased in to use on a scrapbook? Anyway, I thought it would look cute on a card, so this is what I came up with. I also used cute patterned cat paper and a metal paw charm. To coordinate with the colors of the patterned paper, I used Brilliant Blue paper, which is a color I rarely use. 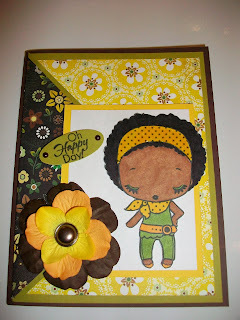 I think it is a bright and cheerful card, don't you think? 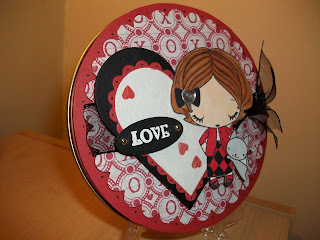 This is a valentine treat holder I made for the Greeting Farm's Club Anya and Friends valentine treat holder contest. The treat holder is a small cookie tin that I received for Christmas from a co-worker. After I ate the cookie, I saved the tin, because I knew I would most likely use it for something. 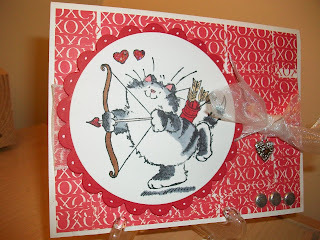 I had recently made a Valentine's Day card with Reeta and her kitty, so I altered the design from a rectangle-shaped card to a round tin. What greater love than the love of a kitty?? 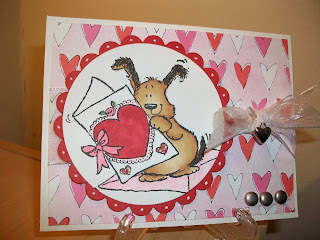 I created these cards for Greeting Farm blog contests. This is the first time I have submitted pictures or entries to the Greeting Farm website. 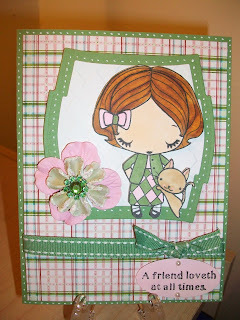 The card with Reeta and her kitty is an Anya and Friends color challenge where we are to use: olive green, pink, dark brown, and sparkle. The image has to be Ian, Anya, Wild Sprouts, or Hope and Grace. While it's hard to see on the photo, the metal charm says, "meow." 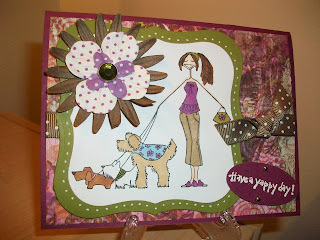 The card with Dorothy Anya and her dog is for the Farm Fresh Fridays challenge. 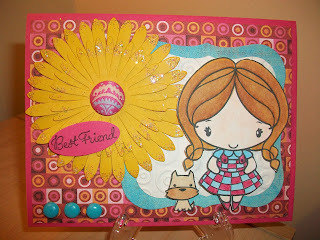 We were to create a sunny card with any Greeting Farm image. I took a daisy flower and gave it glitter for a "sunny look." The nice thing about the Greeting Farm contests is that you can actually win rubber stamps or digital downloads. Even if I don't ever win, it's fun to play along. 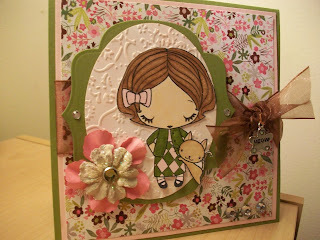 I made this cat sympathy card with my new Speedy the Cat's Designer Collection stamp from Mark's Finest Papers. Can you see Speedy the cat sitting on the fence? I thought this image would make a good cat sympathy card. The inside of the card says, "sunny sills and catnip treats, light to chase and friends to meet, soft, warm laps and petting hands, safe with God in cat heaven." 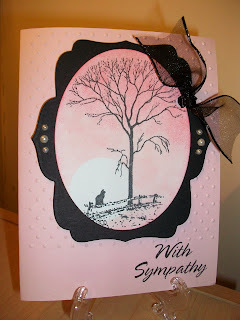 Anyone who has ever lost a pet knows how touching it is to receive a pet sympathy card. This card will be sold at the upcoming STAF shelter fundraiser. This card features three partial images of a fat cat from Magenta. I have a soft spot in my heart for fat cats, especially my late-beloved cat, Wally. Fat cats are just plain cute and they make me smile. 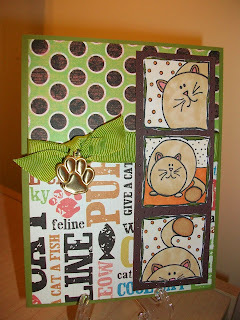 :) This card features a metal paw charm and patterned paper from the DCWV Pet's Stack. I purchased these paw charms from Mark's Finest Papers and I love them. They add so much to a card. 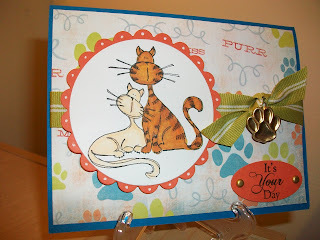 This card features two sweet cats named Sadie Bell and Otto Cat by Stamps by Judith. I was able to practice Copic color combinations for coloring an orange tabby cat. 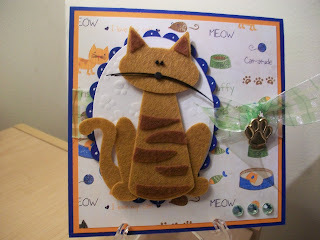 The card also features cat-themed paper, a metal paw brad, and ribbon. The inside of the card says, "Have a purr-fectly wonderful day!" 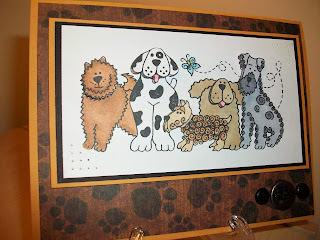 This card was made using a stamp from the retired SU set called "Canine Capers." For added interest and dimension, I colored and popped-up the dogs heads. The large brad on the front of the card says, "go fetch!" 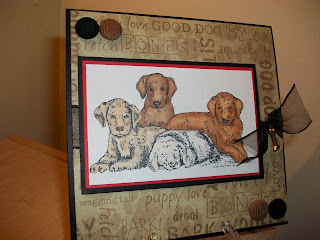 This card was made using a sweet dog stamp from Northwoods. I spent a great deal of time coming up with the Copic marker color combinations to color the dogs. The wide variety of colors of Copics allow you to color the subtle shades that would not be possible with most markers. This card also features corduroy brads and a metal bone brad. 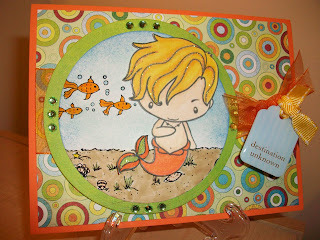 This is a whimsical card based on a card I saw on Splitcoaststampers. I changed it around somewhat, but kept the same basic idea. The kitty has a black tie on and is ready to dine on, (or has already dined on?) fish. How cute!! Here are the cards I made to be given to the room sponsors at the STAF shelter. I made 18 cat and 4 dog cards. 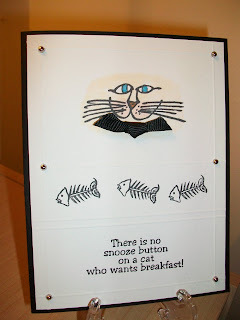 I thought I would be making a different cat card, but it turns out that Anne liked this one better. Each of the images is from Penny Black. I added a heart charm, brads, and glitter for sparkle. 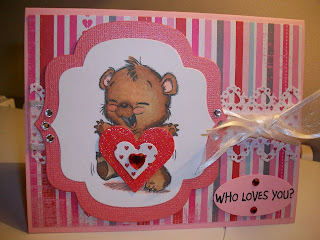 For these cards I used Bella stamps from Stamping Bella. 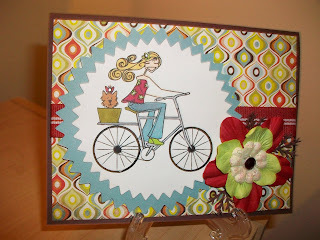 The one card features Bella riding her bike with her little doggie in the back basket. The other card features Bella walking her three dogs. Bella is a "diva" who also does many other things, such as garden, drink coffee, and ride a motorcycle. Only a "diva" would ride a bike or walk dogs in high heels. My cat snowball can't decide if he is hi-tech or low-tech. You will notice he is sitting on a heavy,old turntable (low-tech) that Craig brought home for Ian. 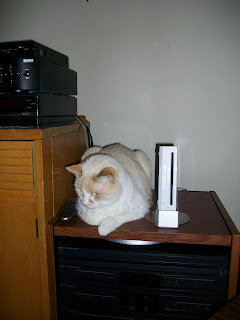 To the left of snowball is our Dish Network box and DVD player (hi-tech) and to the right of him is our Wii game system (hi-tech). So, is Snowball hi-tech or low-tech? Who knows, but he sure looks comfortable. I made these cards with my new criss cross die from Accucut. The dies cut out all of the basic card pieces. The inside note card pulls out so you can write a greeting. This card works well with patterned paper. 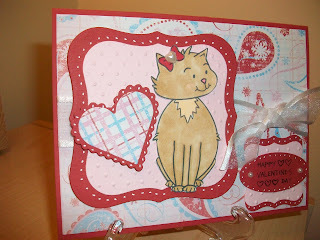 One of the cards features a Valentine's kitty and the other features a snarly cat with an attitude. Each of the images are from Penny Black. 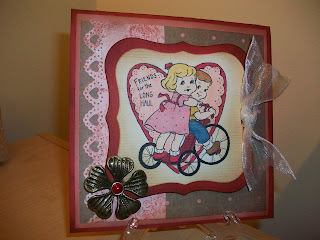 I made this card with my Vintage Valentine's set from SU. 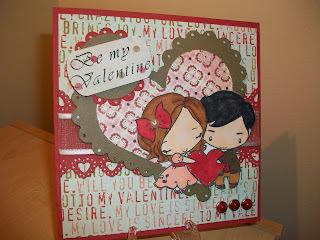 I think this set is one of my favorite Valentine's stamp sets. It was retired several years ago, so I bought mine on Ebay. It is hard to come by and not very cheap, but it is definately worth having. I colored the image with duller, vintage-like colors, and sponged the paper with Tim Holtz's Vintage Photo ink. The lacey heart border and the metal flower top off the vintage feel. 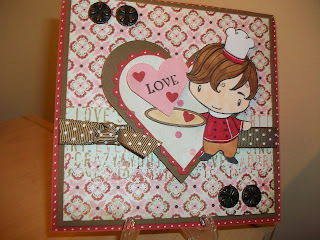 This card features chef Ian, serving up a plate of love. I'd like to take credit for the design of this card, but I CASE'd it from Splitcoaststamper's, Faith H., aka. Markie's Mom. She is one of my favorite card designers. She now has her own company now, called "Mark's Finest Papers." The main things I changed on my version of the card is the paper and ribbon. Chef Ian comes with many items, such as a cake and presents, but I never would have thought to have him serve up a heart. How clever! I'm very happy with how my version turned out, but I wish I were as creative as Faith. I wasn't planning to purchase anymore Valentine's stamps, but when I saw this cupid kitty at Archiver's yesterday, I had to buy it. As always, I can't resist a cute cat stamp. At least I got 30% off. 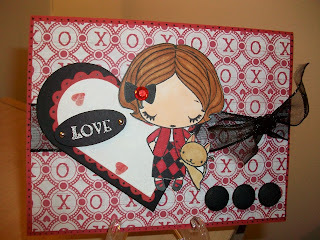 This was a quick and easy card featuring ribbon, blitter brads, and a heart charm. 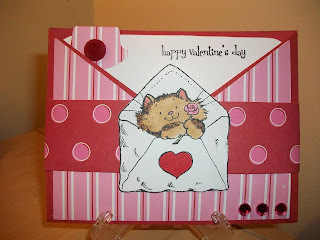 This is the Valentine's day card I designed to be given to the cat room sponsors at the STAF shelter. I usually have to make about 20 each year. 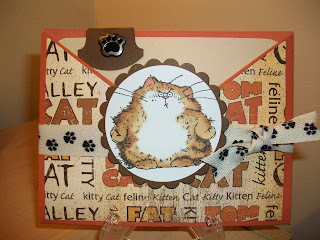 The cat on the card is a digital download from Digi Stamp Boutique from UK. 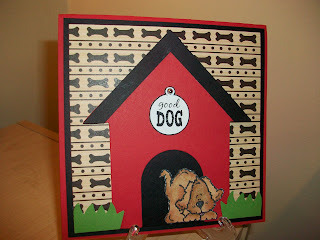 They have several cute cat and dog images that are fairly inexpensive. For this card, I cut the cat's tail off, but I think I will keep it on for the other cards I make. 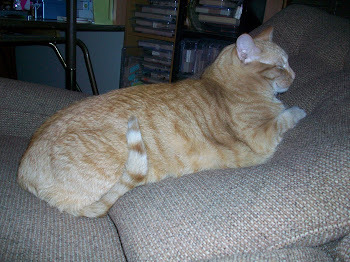 While sitting here typing this, my cat Oscar is scouting my craft room looking for ribbon to chew, eat, and vomit. I try to keep all of the ribbon put away, but he always manages to find a piece or two. I should also mention that my cat Tiddler loves to chew and shred paper. Ah, life with cats!! For this card, I used the digital download from The Greeting Farm. It features Anya and Ian holding a heart. The nice thing about the digital downloads is that you can print them any size you would like, unlike a traditional rubberstamp. 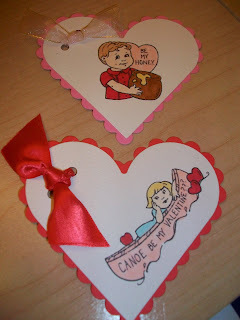 I used designer paper, heart-shaped Nestabilities, a Martha Stewart heart punch, and glitter and brads for bling. The image is colored with Copic markers. I think that the stamps from The Greeting Farm are quickly becoming some of my favorites. My son, Ian, really thinks it is cool that this company has a character that shares his name.